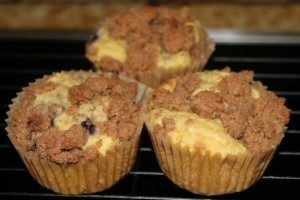 I’m going to try these as a cake next, baking 40-50 minutes, although I like the muffins cause I only eat one at a time. J These are based on muffins by Maria Emmerich, from one of my favorite cookbooks, Low Carbing Among Friends, Volume 2 – link below. Preheat over to 325° F. Grease or line your muffin tins. In a large bowl, mix almond flour, baking powder and salt. In another bowl mix eggs, butter, sweetener, lemon juice, almond milk, vanilla and stevia. Add the wet ingredients to the dry and stir until just combined. Fold in the berries gently. And split batter among the 12 muffin tins. For the topping: In a small bowl, mix first four ingredients together. Then add the melted butter, almond milk and stevia. Stir, to form a crumb like topping. Sprinkle over muffins. Bake 30 minutes or until light brown. Enjoy! Click the image to take you to the Amazon page for the book. I have all the volumes of these books and love them!